Two weeks ago, Ludosity participated in the four-day Games Against Ebola game jam. 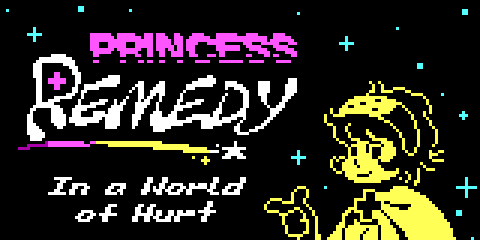 Daniel and Anton made Princess Remedy In a World of Hurt, with music by Mattias and Stefan, and Simon and Nils made Fist of Healing with more music by Mattias. In Princess Remedy, you travel around the world to heal people with various ailments. The “Healing Mode” is a single-screen action sequence where you shoot band-aids and throw a limited amount of flasks at enemies like viruses and ghosts. Most of the ideas came from looking at Anton’s various concepts made before the game jam, which were expanded upon on our whiteboard on the first day of the jam. 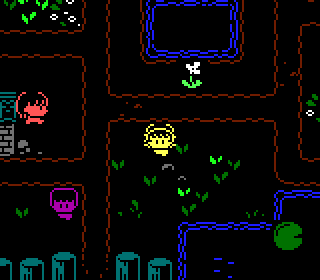 Since we had four days, I figured it should be possible to make a fairly small RPG world with plenty of characters to heal, and several different enemies. 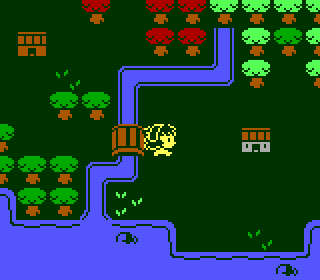 After coding the overworld and basic battle screens, I received 64 NPC sprites and 16 enemy sprites from Anton, and two sets of tiles for the overworld and towns. With only two days left, I made the overworld areas, 49 regular battles, spent about four hours on the final boss, wrote the dialogue (hence why it’s so simple and rushed), and in the final hour of the jam added a save system. Since me and Simon decided to skip sleep on Saturday, I worked for about 32 hours straight, and managed to finish the game without having to cut any content from the plans. We also got a set of sweet final boss tunes from Stefan near the end. Graphics for a jam game should be quick and fun to work with. I decided on a very low resolution look with very few colors on heavy black backgrounds. To spice it up I decided I should only use 1 color per 8×8 pixel block on a sprite or a tile, and I had Daniel code the sprites “erasing” tiles below them (it looks cool! Oldey!). This isn’t to emulate a specific console (although that is fun, I wasn’t up for that kind of dedication in a jam timeframe) but merely because limitations like these are fun to work with and forces one to be creative and try new things. And trying new things is a key to improvement, I feel. This simple style, combined with very clear instructions on exactly what graphics we needed and how they should be set up, allowed me to churn out all the graphics in 2 days. Which was necessary since I would be away on the weekend. The biggest thing I had to make was the final boss. For his concept design, both me and Daniel drew simultaneously on the whiteboard, just doodling whatever we could think of. Then I simply polished that design and translated it to pixels (still adhering to the 1 color per 8×8 area was the thoughest part!). While the graphics are technically emulating something older than the NES I didn’t want to go that far back with the music. Thus the music is made by samples from the NES and the Gameboy, but disregarding any limitations those console would have. I played around with the noise sounds and with using moody arpeggios, also, I’ve been very much into jazz since the Card City Nights OST, so a jazz track naturally made it in there. All in all, I’m very proud of the soundtrack. Scrolls released on Android tablets! The tablet version of Scrolls we helped Mojang develop is now finally released! Download on Google Play below! We should probably merge it directly with this website somehow (we’re tinkering with a new design for the site) but for now they’re separate.